Note: We have been informed that use of online storage services does raise some concerns regarding protection of privacy (Freedom of Information and Protection of Privacy Act – FIPPA), especially due to the fact that data on these services is more than likely to be stored outside of Canada. In addition to potential risk of data/security breaches from the internet at large, governments also have varying policies and powers regarding access to private data stores. With this in mind, we would reiterate that it is critical to not store patient or other private information on cloud storage services. In addition, to respect copyright, when sharing articles, users should only send the citations (eg. PMID, DOI or web citation) rather than the actual files. Like many physicians, for many years now, I’ve been using electronic-only copies of journal articles (pdf files) for my own continuing education, reference and teaching purposes. When discussing the latest clinical trials with trainees, I’d often email them articles for discussion. In order to always have these available, I would store them on a USB flash memory key, or upload them to my MobileMe iDisk account, then access and download them as needed. While this works well, it did require me to always remember to update my flash drive when the newest guideline came out, or find a computer that could access my web account, then paste the file or link to an email. This is was often not possible because of the very restrictive computer policies at hospitals. Dropbox (www.dropbox.com) is a free web service that offers users a 2GB (or 2.5 GB with a referral link* – http://db.tt/HZEQPHT ) storage repository on the web (“cloud storage” is the emerging term for services like this). There are paid plans ($99USD/year for 50GB), but I suspect for the majority of users, the free accounts offer plenty of space. Once installed on your computer, a new folder called “Dropbox” is created. Anything you put in this folder synchronizes to the web. The biggest advantage to Dropbox is its ubiquity. The service can synchronize the contents of your Dropbox to any and all of your computers (Mac, PC, Linux) as well as any of your mobile devices (iOS – iPhone, iPad, iPod, Android and Blackberry), and is accessible from any web browser. The synchronization feature is automatic and ensures your content is always up to date at all of your access points. Sync is important because it allows you to access the files when not connected to the internet. On computers, the files will be current as of the last time it was connected to the internet. On a mobile device like an iPad, you can set favorite files from the Dropbox app that will remain in the device’s local storage even when it is not connected to WiFi (note you need to flag the specific file(s) you want stored locally beforehand). In addition, Dropbox just introduced a sharing feature that allows users to send download links to anyone, even if they don’t have a Dropbox account. This allows users to share files that are too large to send via email, and since the sharing link can be sent from the web browser, restrictive IT policies won’t get in the way of sharing a file (these policies often restrict computers from saving any files from the internet or attach them to emails being sent out). Dropbox also has an interesting versioning feature built in. This saves all versions of a file that you’ve uploaded to the service, so, for example, if you’ve made edits to a Powerpoint or Word file and for some reason need to revert or look at the original version, you can log onto the website and look at the edit history. None of the other cloud services have as many supported apps as Dropbox. Many apps on iOS and Android use Dropbox as a storage drive, so that edits done on your PC, cell phone or tablet are always reflected no matter where you access them. I keep a folder of “Teaching Files” with over 150 journal articles and guidelines that I can pull up during teaching rounds or send links for further reading. I’ve often emailed the articles to the residents before we’ve even finished discussing the case. 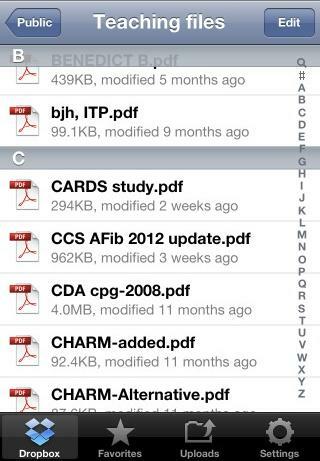 As I identify and download journal articles that I want to read, either on my computer at the office or home, or on my iPad, I save them to my Dropbox account as I go. I have a folder called “Reading List” to store these in until they are read and moved into “Teaching Files,” for example. I use my iPhone to take pictures and video of interesting pathology (eg. clubbing of the fingers, asterixis in encephalopathy) and then show these to trainees during teaching rounds, using either the iPhone screen for 1-3 trainees, or the projected computer in the morning report room for larger groups. Edit: I have now heard this could bring up FIPA (Freedom of Information and Privacy Act) privacy concerns, even with patient permission to use the images, so I will no longer be using Dropbox to hold patient images (even non-facial images can contain identifiable cues like jewelry, moles, tattoos, etc). Most of my Powerpoint presentations and handouts are too large for email services (many email services max out at 5MB) so instead of attaching the file, I send an email with a “Sharing Link” generated by Dropbox. I store presentation files on Dropbox, but edit them on either my home computer or laptop. That way, the latest version is always being worked on, and I don’t have to worry about making sure I copied it to the laptop in time for the conference. If disaster strikes (eg. my laptop won’t boot, is stolen, or won’t connect to the projector), I can then download the talk onto my iPhone and present from there (using an iPhone to VGA cable), or use a computer at the conference site with internet access and get the latest file from the web. I keep copies of relevant Pharmacare special authority forms (prefilled with my data), scanned requisitions and patient handouts so that they can be accessed from my office in Vancouver or in Richmond. This saves time and desk clutter since I don’t need to keep the pads of reqs physically at my desk. I do caution against storing private data (patient records, financial information, etc) on cloud services unless you first encrypt the file with a strong password. Any time you have data “in the cloud” there is a risk of exposing that information. Last year, Dropbox did report a 4 hour lapse in their login security mechanism that they reported affected fewer than 100 users, but this does drive home the fact that we must always be mindful of securing patient and personal data. The availability of backed-up, always accessible data paired with mobile devices having ubiquitous internet access will fundamentally change how we manage information and educational resources. * Disclosure: referral links earn both you and the referrer (me) an extra 500 MB. I am already at or near my maximum referral bonus, and there are no financial or other rewards for referrals. Get Dropbox for free (2GB storage) at: www.dropbox.com. Or, use this referral link for 2.5GB storage free: http://db.tt/HZEQPHT. See my disclosure above. While Dropbox is available for mobile devices, it’s best to set it up on your computer first. Once you have the Dropbox folder set up, you can simply copy files that you want backed up and synced to the Dropbox folder. Set up folders within Dropbox like “Forms”, “Reading List”, “Videos”, “Pictures”, “Patient Handouts”, “Journal Articles”, etc. You simply organize files by moving them into relevant file folders on your computer, and the Dropbox program will reflect these changes on all devices automatically. Unfortunately, the mobile apps don’t move files between folders. This is how I move files from my “Reading List” folder to the “Teaching Files” folder once I’m done. You can get pdf versions of Pharmacare special authority forms at: https://www.health.gov.bc.ca/exforms/pharmacare.html. I prefer to save files as pdf documents. This way, formatting is preserved and is readable almost anywhere – the end user does not need to have the original program to see the file, just a pdf reader application (built in on Macs, Adobe Reader is freely downloadable for PCs at adobe.com). I save patient handouts, Word documents, Keynote and Powerpoint documents, and webpages as pdfs. The easiest way to convert files to pdf format is to use your computer to “print” the file as a pdf. That way, any content you can print out can be saved as a properly formatted pdf document. On a Mac, this functionality is built in. Choose to “Print” any file, then click the “PDF” box in the lower left hand side of the print dialog box. Then, choose your Dropbox folder to save to. On a PC, get any program which can print pages as pdf documents to do the same thing (I like CutePDF, a free PDF print program – http://www.cutepdf.com/Products/CutePDF/writer.asp), choosing the installed “CutePDF Printer” as your printing device, then saving the file to your Dropbox. Don’t put private data without encryption on cloud storage services. now I know what that dropbox icon is on my desktop!! I am not that cmptr savvy yet – long way to go!! Good idea. I didn’t know that there is a 2.5 G free version. Thanks. Dropbox has been very useful in daily use. It also updates all my photos to my computer at home or the office. It makes my smart phone a perfect little mobile scanner. A very recent free offering from Google is the Google Drive which provides a 5GB virtual drive. This is very similar to Dropbox except it is seamless with Google Gmail users. Disclosure: I wished I owned Google stocks….. I was just made aware of a HIPAA privacy concern (Health Insurance Portability and Accountability Act): pictures of patients, even if not including the face, could potentially show identifiable cues (moles, rings, etc), thus it’s probably not a good idea to upload these unprotected to the cloud, either. Thus, I’ll amend the post to reflect/remove this use of Dropbox (I always ask patients if it”s OK to take their pictures/video, but the HIPAA concern stands). The article already states we should not upload private patient data to cloud services without adequate encryption. I didn’t realize there were apps that could do all this. I feel I should start paying attention to all this new technology. Thanks. This sounds very useful. Do you just use it on your portable device or can you log in on your hospital computer? Our IT department has blocked the use of Dropbox on hospital computers – is that anyone else’s experience. I am hoping to change their minds with this article, but it would help if I knew that other facilities had this available. i think this is a very timely topic – thanks for sharing. In general UBC copyright does not allow for distribution of articles even when all parties are covered by the copyright agreement, i.e. you can send a link to students (a DOI link works best in my experience), but you cannot send the article pdf. Mirroring concerns voiced in your May 30 response regarding HIPAA and patient privacy, and also Copyright (copyright.ubc.ca) voiced in Eli’s comment. Now, please instruct us on encrypting files. That is a great article. There is a similar cloud based service similar to Dropbox called Evernote. Evernote has similar features including the ability to tag your notes and also has search for words that are visible in a photograph. For example, you can photograph a presentation slide and Evernote will put image through OCR so that you can later search for word. Like Dropbox, Evernote is platform agnostic and seems just a little “smarter”. The other feature, compared to some of the cloud drives is that all the data can be stored on your device, and is immediately accessible, and there is an excellent markup system to highlight notes. There is also a related app called Penultimate for iPad that exports written notes directly to Evernote. Evernote also has a calendar to-do function with reminders. I use both systems, but use Dropbox more for archival backup storage. I use Evernote daily and at this time have over 5000 notes. It has been particularly useful for board review!